Order in the next 3 hours, 19 minutes an 56 seconds for same day shipping. The large marking size enables you to inscribe your contact details as well as specify the nature of your business, add a logo, an image or even a signature, and also the date. Self-inking Professional 5211 can be customised with your individual text up to 12 lines, logos and images added effortlessly, creating an impression size of 85 x 55 mm. The Professional range of self-inking rubber stamps is extremely reliable due to its robust metal framework yet light due to its outer plastic casing. The positioning frame and rubber feet enable precise positioning of the stamp impression and there is an actual size index window for easy reference. The ergonomic design and handle ensure optimal comfort and professional self-inking rubber stamps are designed to minimise repetitive strain. 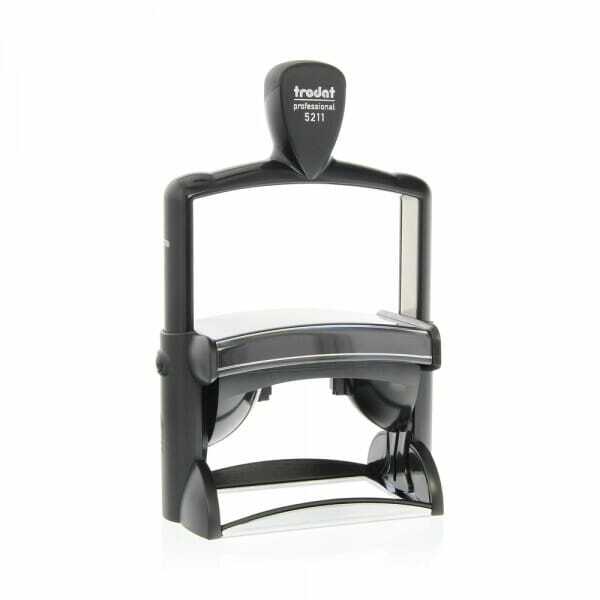 The Trodat Professional is the ideal large stamp for repetitive office use and heavy duty applications. The large imprint area is ideal for various uses enabling you to stamp contact details, name & address, logos, accounts coding or any unique message of your own design. If you require a new replacement ink pad for your rubber stamp the correct pad is a 6/511, which can also be purchased through the website. The pads are available in 5 standard colours: black, blue, red, green and violet. Dry felt pads are suitable for special inks. Customer evaluation for "Trodat Professional 5211 85 x 55 mm - 12 lines"